An Outlook for Mac user wanted to know if it was possible to display multiple time zones in the Outlook Calendar, like you can in the Windows version. Yes, you can now use multiple time zones in Outlook for Mac. Microsoft listens to user requests and adds the most popular suggestions, and as of Outlook for Mac version 16.11 (180311), the Calendar supports two time zones. Right-click on the time scale in the day or week views. You can also enable or change the second zone in Outlook's Preferences, Calendar. Note that the default zone for new appointments has nothing to do with the default zone used in the time scale. If you want to change the primary time zone, you'll need to change the Time Zone on the Mac. Unlike in Outlook for Windows, you can't swap time zones. 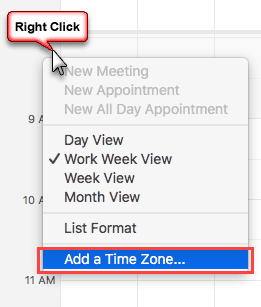 If you want to swap zones, you need to change the time zone on the Mac and change the secondary zone in Outlook. Just to add an additional data point, I'm also missing it. I am on office 365. As far as I know, it is available for everyone, not just people on an insider build, but you could try the Insider slow option and see if it comes up. I am running the latest version and also have O365 account and my Outlook 2016 for MAC doe snot show this as an option??? Other ideas? What is your build #? I'm still 180409 and have the dual time zones in Day and Week view. It's possible it's a bug in the newer version. Seem to be this feature disappeared again in Version 16.13 (180401) :-( or at least I cannot activate it on my Macbook. Nothing would surprise me. :) The last few mac builds have been buggy. I still have it here in build 16.13 (180401) - this is an insider build. Yes, but I don't believe this works unless you have a Microsoft 365 subscription. Does anyone know if this will be rolled out to all users? Yes, right now its definitely subscribers-only. I'm not expecting it to be added as a feature to the perpetual version until they release an Outlook 2019 for Mac. version. Ahhh, no wonder I cant find it in my Outlook. Dang it!